Common speaks during the Starbucks annual shareholders meeting March 18, 2015, in Seattle. Common spoke as part of Starbucks’ Race Together program, an effort to promote discussion on racial inequality in the United States. It doesn’t matter to New Jersey’s Kean University that Common just took home an Oscar for his song “Glory,” which appeared in Selma. What matters to the university is that in Common’s discography is a song that shows his support for Assata Shakur, which has led the university to cancel his commencement address. 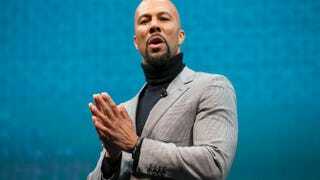 Common, who recently said that black people should show a hand in love to white people when it comes to racism, was scheduled to give Kean’s commencement address next month—that was until someone came across his song “A Song for Assata.” On Monday the university announced that Common had been selected, but by Tuesday it had axed him. Susan Kayne, a university spokeswoman, told The Record that the announcement was made prematurely. Apparently New Jersey State Police took issue with Common’s old song because of Shakur’s conviction for killing a New Jersey state trooper. “What is troubling here is that a state university that is subsidized with state taxpayer funds is once again being questioned on their decision-making at the highest levels,” Burgos said, according to The Record. One has to wonder how Common feels about this. Maybe he should extend a hand in love to them and talk it out over a cup of Starbucks and #racetogether.